Uber-busy teachers feel free to download ‘How to set up your own Lesson Jam’. Here are also some cute pics from the first Berlin Lesson Jam. See? We’re human and we don’t bite. ‘Time flies‘ lesson plan. There’s a time-guessing game and learners talk about their ‘busiest day’. In exchange, can you spare 10 minutes to read this post and comment? I realise that this post is quite long so here is a print-friendly version. Feel free to print it out and read it at your leisure. Thanks. I knew I could rely on you. I’ve been in the ELT world for nearly 10 years. While not a veteran, I’ve had glimpses of how this world works. Moreover, from what I’ve seen and experienced, I think that working teachers deserve better. Don’t get me wrong, good institutions should be praised – and I’m still in touch with schools that treated me well. So yes, point one: I want to see change in ELT. Can you be more precise? Do you have a story to illustrate what you’re saying? Right-o. One day a student of mine came up to me after class and asked me if I would be in a witness in a court case. A real court case. To cut a long story short, this learner had been sold a VERY expensive package of lessons (we’re talking thousands of euros) and when she turned up to the ‘Advanced’ class she was the only person who could string a sentence together. Naturally, the ‘school’ refused to give the learner their money back. If people know about it, then why don’t they do anything about it? Anything else you’d like to offload with that chip on your shoulder? Yes, actually! 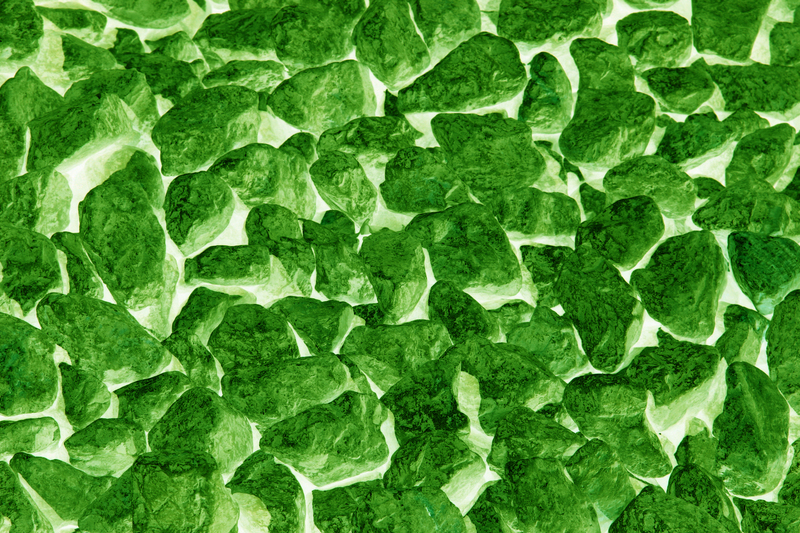 Working conditions of teachers – the kryptonite of ELT. Everybody knows that problems exist but no one wants to talk about them. It’s just not ‘the done thing’. Whenever I speak about working conditions and possible solutions most people make a mental retreat into the realms of ‘it’s too complicated’, ‘how would we solve this problem’, or ‘people have tried before and failed, so will you’. This isn’t helpful. More importantly, it shows a lack of respect for all of those teachers suffering from problems. Ever signed a dodgy contract in a foreign language? Your problem, mate. Ever had your pay withheld? Your problem, mate. Ever had a boss who’s psychologically impaired i.e. nuts! Your problem mate – don’t bash schools! The one thing to be said in favour of this position is that it’s a useful psychological defence mechanism against change. If anyone has read the Nobel prize-winning Polish writer Czesław Miłosz, then you’ll know the concept of ‘Ketman’. This is the situation of being able to hold contradictory positions at the same time, without any psychological problems. And it’s the same in mainstream ELT. There is simply no existing contradiction between working in an industry where ELT companies make millions while teachers’ working conditions are worsening year-on-year. Ketman fills the man who practices it with pride. Thanks to it, a believer raises himself to a permanent state of superiority over the man he deceives, be he a minister of state or a powerful king: to him who uses ketman, the other is a miserable blind man whom one shuts off from the true path whose existence he does not suspect; while you, tattered and dying of hunger, trembling externally at the feet of duped force, your eyes are filled with light, you walk in brightness before your enemies. It is an unintelligent being that you make sport of; it is a dangerous beast that you disarm. What a wealth of pleasures! People can accuse me of having a chip on my shoulder (and they have) but what I can’t be accused of is doing nothing and accepting the status quo. This includes learners being ripped off, and teachers being underpaid. 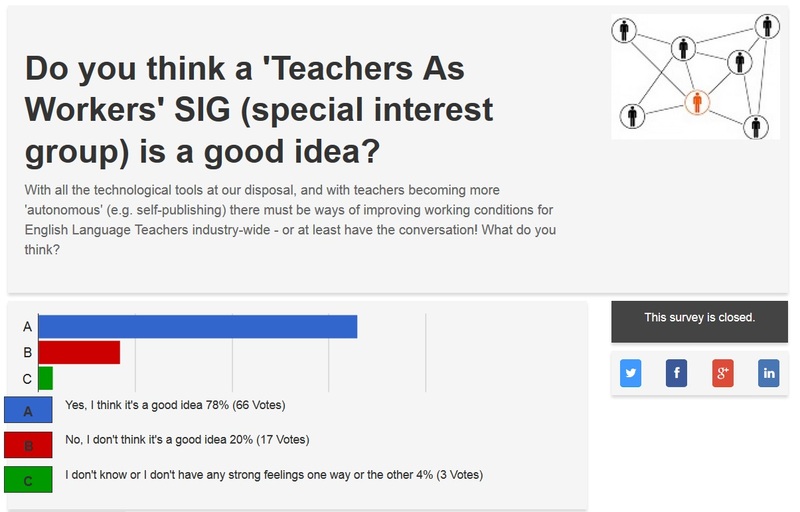 Therefore, I organised a Twitter survey in May this year with the question: Do you think a ‘Teachers As Workers’ SIG (special interest group) is a good idea? As you can see the overwhelming majority of teachers who responded supported the idea. Unfortunately, the trustees of IATEFL did not agree. I shared ideas with another ELT blogger – the award-winning Nicola Prentis – and we submitted a proposal to IATEFL asking to create such a SIG: Teachers as Workers (TAW). The first reason given was that the proposed SIG did not fall within the ‘professional development domain’. From my point of view, I suppose it depends who is defining the term ‘professional development’. I would argue that for a new generation of ELT teachers and trainers, against a background of globalisation, the ‘Pearson-isation’ of ELT and static or falling wages, professional development means something entirely different. And can’t we talk about this? What I propose is that people just start having a conversation; that we say ‘what’s the first thing we can do to address this problem‘. It’s debatable whether top-down solutions to working conditions have worked, or are working. No matter how many scraps of paper from EAQUALS or the British Council a school can gather – it can still be a miserable place to work. If the current institutions in ELT can’t address, or won’t even talk about these problems – perhaps another parallel institution can? That’s when I got the idea for a grassroots association. Berlin Language Worker GAS, Berlin GAS for short, is our grassroots association. We wanted as many people as possible to participate, so we also welcome teachers of other languages, as they face similar problems. To be fair I just set up the Facebook page and the first meeting – the rest of the work has been done by the group itself. From the very start it was blindingly obvious that by and large, we all had the same concerns: getting work, keeping work, and health care (a particularly thorny problem here in Germany). After some discussion about the issues we faced, we boiled everything down to two broad themes: insecurity and isolation. It should also be mentioned that Berlin is something of a special case: a large number of teachers are freelance, and language schools and institutions very rarely provide training or opportunities for teachers to meet. But this isn’t important – what is important is that teachers are able to come together and organise to solve common problems in their own particular contexts. As a group we decided that a good strategy to start chipping away at these problems would be to provide social events. So the ‘Teacher Pizza’ was born! Recently we also staged our first live event – the ‘Lesson Jam’. An autonomous social group where freelance teachers, trainers and other professionals get together, support each other, maybe learn something…and have fun. As teachers, we don’t need to stand by and accept poor working conditions, and just by sharing information some of the isolation and insecurity can be alleviated. It’s hard to get people to come to meetings. But what we’ve tried to do is keep the engagement threshold as low as possible and provide different ways in which people can participate. 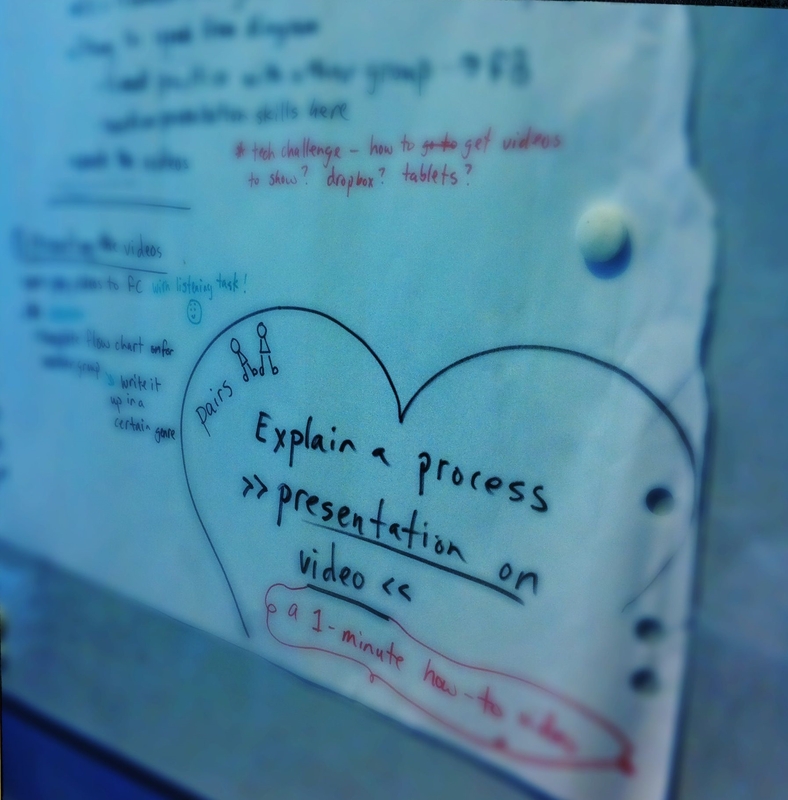 At the start of the group I said to everyone ‘let’s do this for 6 months – then decide whether to continue or not’. Lowering the engagement threshold makes participation easier and more attractive. People can post on Facebook or on our Wiki, they can attend the Wiki Jams online or even attend a meeting online via Skype chat. The engagement threshold is low because we know how busy working teachers are. I was also influenced by the ‘Lean Startup‘ philosophy, particularly the principle of MVP. From the product development world, this is the principle of building a minimum viable product; then fine-tuning and improving the product later on in the process. What’s important is that the core features are functioning. So we have a FB page, a Wiki, we meet, have events – but we’re still developing. 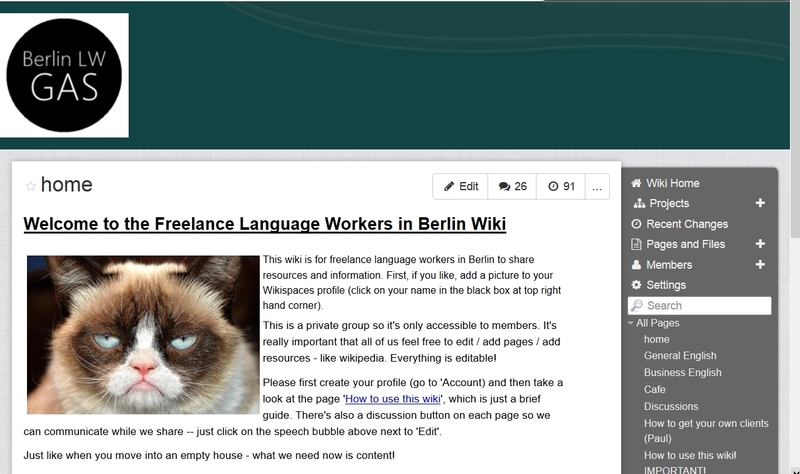 Oh, and we have a grumpy cat on our wiki. We like grumpy cats (thanks Sherri). We also have an excellent relationship with the local professional association for English Language Teachers in Berlin (ELTABB), who have been very supportive (special thanks must go to Dale Coulter here). Finally, we strive to be leaderful, by which all members of the group share leadership. And the impetus for projects comes from whoever shows up with a good idea and some energy. Precursors. Nothing comes from nowhere. I was particularly inspired by Cooperativa de Serveis Lingüístics de Barcelona (SLB), a group of teachers in Spain who are organising for better working conditions by forming their own cooperative and George Chilton from SLB has been very supportive . Check out their site for more info; I particularly like George’s blog post ‘Five questions about fair pay, respect, and equal rights for TEFL teachers‘. Allies. No matter how militant you are, or how much you want to change things, you won’t get far without allies. And with limited resources, any grassroots group needs all the help it can get! I would encourage anyone forming a grassroots association to try and find allies in existing networks and build on those relationships (and you might be surprised at the support you receive). We’ve only been going for about five months and we’re still finding our feet. We have a Facebook page, a logo, a Wiki and two innovative event forms, the Wiki Jam and the Lesson Jam. What we’d really like to do is to spread this idea. So…if you are interested in setting up your own GAS – then go right ahead! It’s not hard, you just need one or two people to take the initiative, set up a meeting, invite people and start. You will be nervous, as we were, but once you get moving on concrete tasks you’ll feel more comfortable. Here you will find a folder with some guidelines on meeting facilitation, a template for writing minutes, ‘How to set up a Lesson Jam’, ‘About us’ and our logo – with variations for different cities! Feel free to edit, remix and reuse (under CC license 2.0). Or design your own logo and documents: what’s important is the grassroots organising, not the package it comes in. Please also check out Community Organizing: People Power from the Grassroots by Dave Beckwith (with Christina Lopez), they have some really useful advice. Remember, to organise a group like ours, all it takes is more than one pissed-off teacher. To paraphrase Marx, you have nothing to lose but your marker pens. And a world to win. Kryptonite. By mypixbox on flickr. CC license 2.0. You didn’t have to give me a lesson to get me to read this! Congratulations and best of luck to you, anything more we can do to collaborate from SLB just let us know! The SIG that can never be in IATEFL terms can become something else. An association of associations could apply pressure if we got our act together. Thanks for writing, and for your ongoing support. The website looks great by the way! Berlin LW GAS stands for ‘Berlin Language Worker GAS’ (GAS= grassroots association) – as we have teachers of other languages in our group. GAS is also light, it can travel, but it’s sometimes volatile! I also totally agree with your point – an association of associations could make a difference. I think previous efforts to change the ‘industry’ failed because of isolation, fragmentation and the peculiarities of ELT. And also any kind of organising is hard work! So let’s stay in touch. Hey y’all, first just to say that this is awesome and so much luck! As a person involved in some TEFL organising (http://libcom.org/blog/angry-language-brigade) myself, it’s great to see others doing the same. Two things I might add. Don’t forget about non-teaching TEFL workers! Receptionists, sales staff, IT workers – having them involved makes out organising efforts stronger and builds the type of solidarity we need to fundamentally change the industry. Thanks for your comments! I hadn’t really thought about non-teaching TEFL workers but that’s a very good point and something to bear in mind. Also, I had no idea of the original meaning of ‘chip on your shoulder’ – so thanks – I’ll never again feel guilty for having a chip on my shoulder! Don’t give up on the effort to push IATEFL into doing something like this – they are supposed to be OUR teachers’ association, so it’s ridiculous that they never talk about working conditions. Same thing with British Council accreditation in the UK. You’ve inspired me to set up a “Campaigning TEFL blogs” category in my blog roll, so please let me know if there are any more blogs or blog posts which qualify. Thanks for commenting! I actually adapted one of your lessons, ‘Option Trees‘ and wrote about it in a previous post here. It’s a great lesson and I’ve used it many times since – so thanks for that! I really like the idea of ‘Campaigning TEFL blogs’ and I’m happy to be in such illustrious company. The (new) TEFL blacklist was also news to me. I also really like the ‘Experimental Language School’ idea – it’s something I’ve often thought about myself. I think students would pay to be taught by an institution which is innovative and treated its teachers well. More suggestions here or there please! This entry was posted on September 22, 2014 by paulwalsh in For Teachers and tagged allies, Change, critical, GAS, grassroots teaching association, IATEFL, leaderful, leadership, lean, Lesson Jam, lesson plan, precursors, professional development, strategy, twitter, working conditions.